This Saturday myself and a fantastic group of volunteers are going to be doing a recipe exchange and lucky dip on Rye Lane, at the end of Highshore Road. 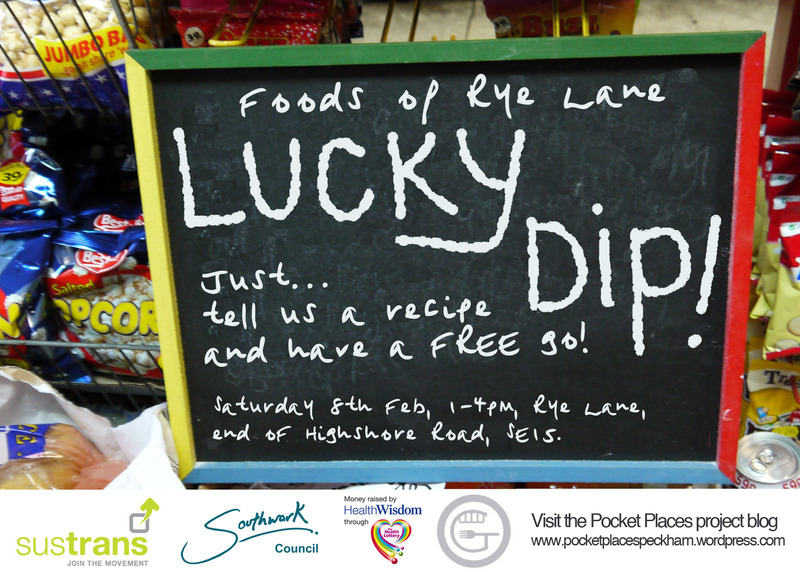 We want your recipes and stories about food and in exchange we will give you a go, for free, on our lucky dip which will be full of all sorts of food available on Rye Lane. We’ll be giving out recipe cards, and we’d also like to see where you’ve been shopping all day, so we’ll be mapping that too. All of this lovely food talk will be recorded and brought together to give our amazing artists at Gourmandizing London (www.gourmandizinglondon.com) all the inspiration they need to paint a mural along Bournemouth Close, behind Rye Lane shops leading up to Copeland Road Car Park. We’re going to be making some exciting changes to Bournemouth Close. At the moment people pick their way through the rubbish and puddles to get to Rye Lane but soon there’ll be food growing there, places to play and some much needed greenery. Drop by on Saturday 1-4pm at the end of Highshore Road, tell us your favourite recipe and get involved in the wonderful transformation of Bournemouth Close.